ICTU will meet today to formally reject the proposals, as a Labour backbencher says a ‘tweaked’ deal could be the way forward. 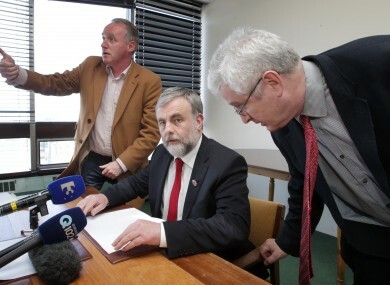 SIPTU president Jack O'Connor at a press conference yesterday, after SIPTU - the country's largest union, which had recommended a Yes vote - announced that its members had rejected the Croke Park 2 deal. THE FORMAL death knell for the Croke Park 2 pay deal will be sounded today, when representatives from public sector unions meet in Dublin to formally reject it. Members of the Public Service Committee of the Irish Congress of Trade Unions will vote on whether to approve the deal, with each union’s representatives carrying a number of votes weighted in accordance with their union’s stance. Yesterday’s rejection of the deal by three of the four biggest public sector unions – SIPTU, the Irish Nurses and Midwives Organisation and the Irish National Teachers’ Organisation – means the proposals will be comprehensively defeated, with over 2,000 votes out of 2,892 being cast to reject the proposals. The rejection puts the government in a difficult position – forced either to carry through with earlier pledges, where legislation would be introduced to give effect to the proposals regardless, or find an alternative way to cut €300 million off the public pay bill for this year. Though the government had previously affirmed its plan to legislate for the cuts, statements from the government last night stopped short of the same claims – instead opting to take some time to dwell on the possible outcomes. This morning Labour backbench TD Gerald Nash said a ‘tweaked’ version of the deal could be a possibility, believing that trade unions would see the merit of reaching a consensus deal instead of having cuts imposed upon them directly. “I don’t think the trade union movement will sacrifice those particular gains,” referring to job security and the guarantee of no further pay cuts, “on the altar of taking an alternative approach,” he said. He told RTÉ’s Morning Ireland that it was Labour’s “instinct” to seek “a consensual approach to this particular challenge”, arguing that a unilateral approach such as imposing pay cuts meant the government could not look for labour reforms – which would need the support of workers to be introduced. “Any reductions in the public sector pay bill would have to be done in a fair and equitable manner, and by consensus,” he said. Brendan Howlin last night spoke with Troika representatives to inform them about the collapse of the deal, which had hoped to cut the pay bill by €300 million this year and by €1 billion by 2015. The prospect of an adjusted deal is further complicated by the fact that some unions have now been mandated not even to participate in talks on another deal – with the likes of the INMO and the Teachers’ Union of Ireland ruling themselves out of talks on a revised successor deal. Labour TDs will discuss the matter at their Parliamentary Labour Party meeting this evening – the first since the disastrous by-election in Meath East where candidate Eoin Holmes won only 4.5 per cent of the vote. Email “Labour ponders 'tweaked' pay deal as ICTU prepares to kill off Croke Park 2”. Feedback on “Labour ponders 'tweaked' pay deal as ICTU prepares to kill off Croke Park 2”.